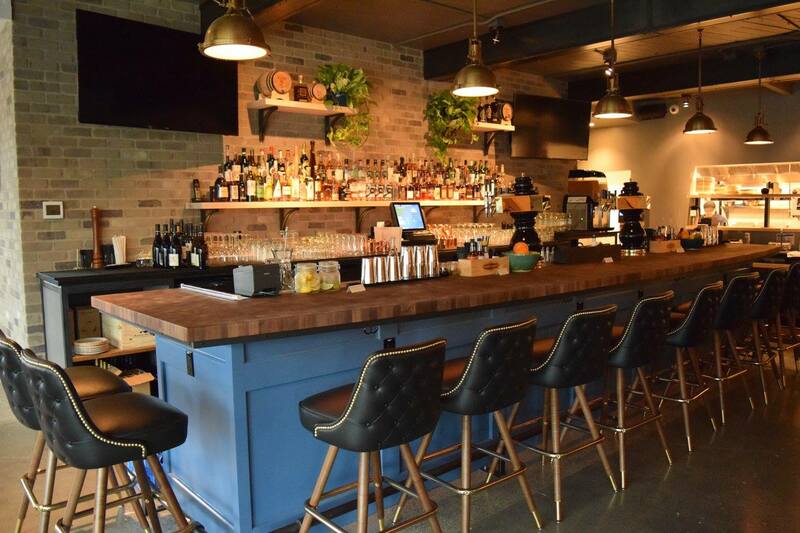 Tucked in near the center of downtown Kirkland, Park Lane Public House (115 Park Lane, Kirkland) is from the folks behind the Bottle and Bull, located just blocks away. The Public House opened at the very tail end of January, but when I stopped by recently for a visit with some pals, it was bursting with Kirkland-ites and already seemed to have a developed a reputation drawing in locals. I can see why, too, as it has a welcoming vibe, with sociable staff and an open space with a bar side and a family-friendly side. Park Lane Public House also provides a menu from chef Peter Worden that travels through pub standbys from near-and-far while maintaining a northwest slant, mostly raising the bar (so to speak) with excellent preparation and a few tasty twists. Take the mac and cheese – an omnipresent dish, sure. But here, it's given individuality, served in a cast iron skillet oozing New York white cheddar and topped with bread crumbs carrying a hint of truffles and crispy crunchy shallots. Another standout was the wild boar sloppy joe, a big hit with one of my carnivorous companions, with its sizable portion and rich meaty flavor accented by provolone and a fried egg, accompanied by delicious thinner-side frites. You’ll find something for everyone with a menu traveling through larger dishes (think seared King salmon, beer battered Alaska cod, Steak frites, and others), salads with seafood, steak, or Mediterranean veggies, a flatbread pizza, and more. For sharing, there are appetizers highlighted by a dish not normally seen with the starters: butternut squash. It was roasted just right (soft, but with a few caramelized edges), accompanied by maple squash puree and a duo of pomegranates, molasses and fresh. Speaking of purees, the Mama Lil’s pepper puree on the hummus was tangy and a nice local shout-out. The cocktail list of nine choices leans towards takes on the classics and has lots of northwest favorites, too. The Urban Bourbon (a good pick on a chillier evening) had bourbon, as you’d expect, mixed with Portland’s Townsend distillery’s spiced tea liqueur and herbally Kashmiri Amaro, as well as Seattle’s E. Smith Mercantile’s smoked bitters. It incorporated herbs, spice, and a little smoke, underlined by the right amount of sweetness. When the sun’s shining in the sky, the daiquiri made in the slushy machine might be the best choice. Super tangy, tart, and icy, it’s sure to cool you down (and, if not so sunny, it’ll help you dream of beaches). You’ll also find 15 beers on draft, with a list that again inclines local, as does the list of 14 wines. For those staying away from the booze (and those under 21), don’t miss the house-made ginger soda, whose grand ginger-ness is backed by a little tart-ness. There are lots of seating options, from cushioned bar chairs if you want to belly up close to the shaking and stirring, to booths and tables – grab one near the big windows to watch the passersby on Park Lane, or one near a TV (there are a few, perhaps one or two too many for me, but that’s to taste) if feeling sporty. One brick wall holds a few massive antique photographs, including an amazing pic of the Juanita baseball team from, I’d guess, the 1950s, and there are some neat macramé plant holders, all of which adds to personality and overall jolliness. As word gets out, it won’t just be Kirklanders packing it in. One of my dining pals (who happens to own the JRA bike shop, so is an authority on this kind of thing), thought that in summer, when the weather’s nice, it’d be swell to take a big bike ride north around the lake, stop at the Park Lane Pub for lunch, and then ride back. Cycling enthusiasts, take note.